The Selmer LaVoix II story is about sound. Your sound. Express yourself through a voice based on the great Selmer tradition. 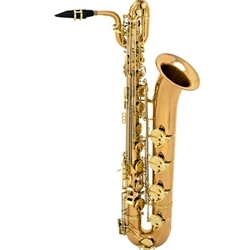 Selmer LaVoix II saxophones are fun to play because they sound great, respond even better, and play in tune. Period. These soprano, alto, tenor and baritone models are capturing the interest of today’s upcoming artists and delivering a modern French sound at an exceptional price. The STS280RC is identical to the STS280R, except that the copper lacquer provides a unique look and rich tone. These instruments incorporate the "right" features, resulting in instruments that are lighter in weight and deliver all the performance demanded by today’s top players. The acoustic response of Selmer LaVoix II saxophones is quick and fluid through all registers and the neck is specially designed with slight resistance. This combination provides for superior response, and teachers also prefer it for embouchure and air stream development. Key design is compact with professional spring tension for quicker facility. Other features include a traditional bell flare, high F# (G on soprano), Low A on th bari, mini-rib construction (except soprano), multiple adjusting screws, and treated leather pads. The instruments feature Selmer USA mouthpieces that help to create an even tone, excellent response and steady intonation. New lighter weight cases thoroughly protect the instruments and offer excellent storage capacity. All models feature fine hand engraving on their bodies and bells. FEATURES High F# key (high G on soprano), Low A, multiple adjusting screws, rocking table mechanism, Blue steel springs, treated leather pads with metal resonators, lightweight backpack style case (ABS wheeled for bari), ribbed construction, Hand engraved lacquer over brass, Selmer USA mouthpiece. FREE SHIPPING with your purchase today!